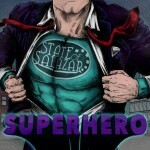 Share the post "Album review: STATE OF SALAZAR- Superhero"
Its four years since State of Salazar released their debut album, and also became the opening band at the very first Frontiers Rock Festival in Italy (to my frustration I was stuck en route waiting for non-existent Bank Holiday transport). In that time the field of Scandinavian melodic rock hopefuls has grown even more crowded, so the title of this sophomore release was a hint that something special was needed to stand out. There has been no great musical change of emphasis, but whereas the majority of their contemporaries look to the second half of the eighties for their influences, it is clear from the opening bars of ‘If You Want Me’ that the Swedes hark back to the glory days of pure AOR earlier in the decade. Indeed the keyboard intro to ‘My Heart is at War’ epitomises everything I love about the genre and the song, with some classic synths and a Styx meets Toto-vibe lives up to the early promise. Toto influences are also present on the classic AOR of ‘Hold Me Tonight’, ‘Masquerade’ which has a more slow-burning, progressive mood and ‘Joanne’, from the gratuitous use of a girl’s name to the way the guitar and keyboard solos compete for attention at the end of the song. At various stages I was reminded of so many of the genre’s obscure greats, from Le Roux and Sugarcreek to the more recent Street Talk and Pride of Lions, the latter a recurring a comparison not just in main songwriter Marcus Nygren’s writing style, but also his vocal resemblance to Toby Hitchcock. Since the first album keyboard player Kevin Hosford has come on board and he also wrote and shares vocals with Marcus on two of my favourite tracks. The opening part of ‘She’s a Loaded Gun’ reminded me of the Eagles and Billy Joel before more conventional AOR influences take over, while ‘To the Wire’ is a glorious mix of Dave Bickler-era Survivor and the sort of song that might have graced Toto’s ‘Isolation’ with a great mid-song synth solo. Is there anything not to like? Well, the production feels a bit more low budget than similar releases, while the ballad ‘Lie to Me’, a duet with Kristina Talajic, is a rather saccharine show tune, plus someone else got there first with its ‘If You Don’t Love to Me, Lie to Me’ lyric. The album also manages not to tail off with ‘Love Will Find a Way’ having a westcoast Chicago feel, complete with sax solo, and the title track an anthem that was a bit of a slow burner. As a finely crafted homage to a golden age I find I can’t stop playing it. Just what is the secret of these young Scandinavian bands? This entry was posted in ALBUM REVIEWS, ALBUM REVIEWS (Mobile), All Posts and tagged album, AOR, Kevin Hosford, Marcus Nygren, melodic rock, State of Salazar. Bookmark the permalink.